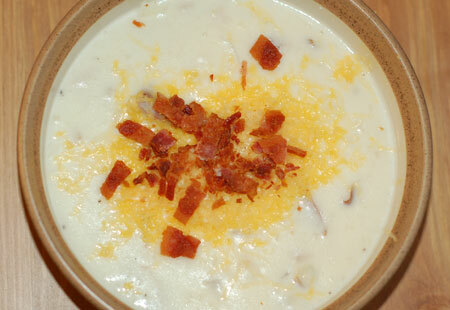 There isn’t much to say about baked potato soup. Sometimes it just hits the spot. It doesn’t hurt that it is made from some pretty basic pantry ingredients, and that it conforms well to on-the-fly adaptation. If you’re pregnant, though, watch out: I had a bowl of leftover soup for lunch the other day, and it was so filling that afterward I felt like my lungs were crushing my stomach every time I took a breath. Pierce potatoes with a fork; bake in the microwave (I used the baked potato setting on mine) until tender. Cool. Rice potatoes; discard or coarsely chop skins (if you want to include some of them). You can also coarsely chop a few of the potatoes instead of ricing if you want a chunkier soup. Melt butter in a large Dutch oven; saute onions until tender and translucent. Stir in flour and cook for a minute or two; gradually add milk and broth, stirring with a whisk until blended. Cook over medium heat until thick and bubbly (about 8 minutes). Add riced potatoes and skins, and salt and pepper. Stir in sour cream and cook over low heat 10 minutes or until thoroughly heated (do not boil). Taste and adjust seasoning as necessary (it may need more salt). Sprinkle each serving with cheese, bacon and green onions. This would also be good with more veggies added to it. Potato soup has got to be one of my favorites. I haven’t made it in awhile, but now I’m craving it! Yeah, it is sooo good on a chilly day, and reheats perfectly. One of these days I’m going to try Morimoto’s mashed potato soup from Iron Chef just for fun.